I've been on the lookout for a color-block blouse, ever since I came across the picture, below, of a French Vogue editor wearing a Celine version, which I wrote about here. 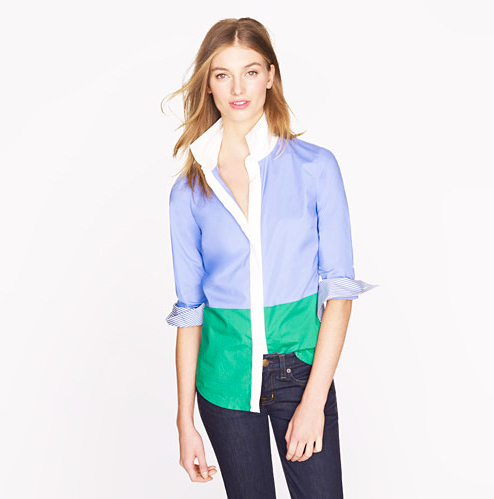 Her shirt is from seasons ago, but J.Crew's take, above, which just hit the racks today, is every bit as vibrant, pinstripe-y, all-purpose, Gallic-girl cool. I love this shirt, too! Would you recommend sizing up for a looser fit, or keeping the look quite tailored/fitted? That's always my dilemma with these shirts. Thank you! Your blog is fabulous. I hope you never stop.